This entry was posted on Wednesday, April 23rd, 2008 at 11:55 am and is filed under Politics, SQL, Mozilla, Security, NoScript. You can follow any responses to this entry through the RSS 2.0 feed. Both comments and pings are currently closed. It appears that the events, although they live on in the google cache, have been removed from the UN.org site. at least the current nihaorr1 attack is easy to remove once you know you're infected - http://tinyurl.com/6g2a95 - but in this day and age anyone maintaining a site open to this sort of attack really does need to spend some time and money on a code and security review! I couldn't actually see any removal instruction in your post (but I may be blind). Anyway I posted some disaster recovery advices for affected IIS administrators yesterday. ironically I first found (and started following) your site a while ago when trying to explain to some folks in a previous job why security actually mattered... this has gone to prove that they should have listened a bit more at the time! It is true, the UN have done nothing to secure their database. It took me no more than a few minutes using a simple perl script to enumerate every column of every table of quite a few of their databases. We know the sql username, server type, hostname etc.I am always harassing our web developers at work over sloppy input validation but they design sites for small web startups. This is the UN for Christ's sake! Um and your point is? 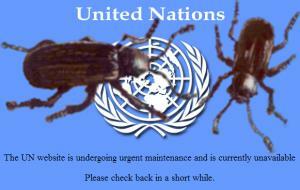 If any site should be hacked it's the UN. They are the enemies of the USA. Why would you want to help our mortal enemies? Third world Marxists and despots, looking to conquer the world. I guess if they can't even run a website, I have hope for our freedom.